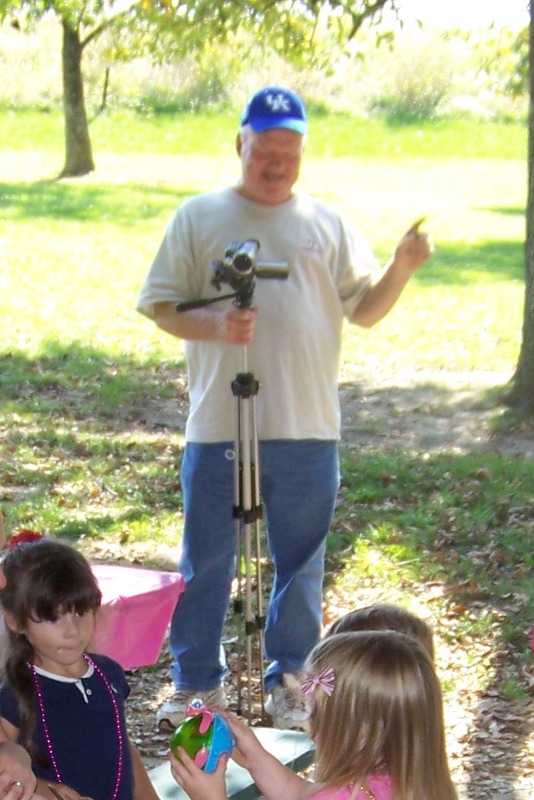 as we remember him - smiling, laughing, and videotaping EVERYTHING so we would have memories to look back on. Yep, that's him. He was a great man. Something we all knew, but didn't quite realize the extent of until we were forced to think about his life all at once. Here is the biography his sons & wife wrote for his funeral service. Bill's family is blessed with enough memories to fill the pages of an entire library of books that will be passed down from generation to generation at family reunions large enough to fill a city. Bill blessed his family with moments and experiences they will forever cherish. As written by those closest to his heart to share the highlights of his life by sharing his memory, this is Bill's story. Bill was born in 1949 and raised on a farm in Kentucky, with 4 brothers and 2 sisters. He grew up as a Roman Catholic. At the age of 23, he was drawn to a personal relationship with Jesus Christ. He had a very personal and dramatic salvation experience. A co-worker witnessed to him on the job and invited him to a Pentecostal Church, where he was baptized in the Holy Spirit. This was where he met his wife of 38 years, Delores. Bill was a skilled brick and stone mason, which God has used to build schools, churches, playgrounds, and orphanages in the United States as well as Romania, Haiti, Dominican Republic, Jamaica, Grenada, and Mexico. God has been able to use Bill's talents and abilities to help numerous missionaries in those countries through his physical labor and his large zest to share joy with everyone he came in contact. In 1990-2000, Bill served, with his wife, in the Royal Rangers Ministry. He was a commander and taught young boys about Christ and the outdoors. He had a very strong passion for the boys in this ministry. Through this ministry, he became very skilled in the Tomahawk Throw, Knife Throw, and Muzzleloader Shooting. He saw many boys come to the Lord through this ministry and built up in God's Word. Bill, through the Royal Rangers, displayed Godly character and principles that the kids could see and emulate. In addition to being a brother and husband, Bill was the father of three sons, and grandfather to 3 grandsons and 1 granddaughter, who were all the loves of his life. He enjoyed spending time with them, camping, sharing the outdoors, going to the park, and attending their sporting events. Bill was very helpful to his sons with building and remodeling projects with their houses. He was always eager to help them get the job done. He also enjoyed sharing recreational activities with them such as boating, skiing, scuba diving, jet skiing, and cliff jumping. All the boys can share stories about their dad's crazy antics, zest for life, and love of adventure. Bill always gave his boys lasting memories when it came to having fun. As part of Bill's helpful personality, he worked for his wife at a chain of local gas stations. He went out his way to help make the stores and the employees proud of their work. Store managers were always glad to see him walk in the door because it meant he would get those things done that were often overlooked. Eight years ago, Bill survived a massive heart attack, which began to limit his activities, but it didn't limit his love for his family, zest for life, and his desire to spread joy. Unfortunately, a second heart attack took his life, but his smile, love for his family, and dedication to God will always be remembered by everyone who knew him. Bill's laugh and encouraging words will be missed by all. The night of his visitation, four sheriff's deputies had to be dispatched to help control the traffic flow around the funeral home. The funeral director said it might possibly have been the largest visitation service they have ever had in that location. For most of the night, people waited in line for over an hour to pay their respects. Instead of the scheduled 3 hour visitation, we were there for nearly 5 hours. This isn't to brag, but to testify to what an awesome man he was, and the number of lives he touched. Quite frankly, I think it has all of us left behind wondering if we are living up to what we can be in this life. What kind of testimony will we leave behind? He sounds like a wonderful man. I'm glad you have all those good memories. Love to you and your family at this time. Aww, what a testament to his legacy! Hugs to all!! So wonderful your family was blessed with such a man. What a testament to his life well spent and the love that will go on in his loved ones.